A little over five years ago, my attention was grabbed by an online news article that talked about a new incubation program being launched at the University of Waterloo for student-founded companies. Dubbed the “dormcubator,” a name that thankfully never really caught on, the program would see the university convert an existing student residence into an incubator for new companies, with company teams applying for residence and receiving a host of support and mentoring services. I thought it was a brilliant idea and immediately reached out to then-program coordinator Sean Van Koughnett and offered whatever help I could from 550 kilometres away. My PR agency became an early sponsor of the program, and I travelled down to what was eventually called the Velocity residence a few times that next year to put on PR and marketing workshops and help mentor some of that first year’s teams. That level of involvement proved difficult to sustain over long distance but I never lost my enthusiasm for what Velocity was doing, and have kept a close eye on the program ever since as it has grown far beyond that original residence-based program. So, a few weeks ago, I was very happy to sit down with current program director Mike Kirkup to catch up on everything that’s been going on and to see where the program was planning to go from here. The way Kirkup puts it, the initial success of the residence program exposed all kinds of new problems. So Velocity conceived of and added new streams of activity to help address those problems. “The residence was a great place to start a company and to meet people,” Kirkup said. But with students moving in and out so frequently, it wasn’t terribly conducive to long-term company stability or growth. 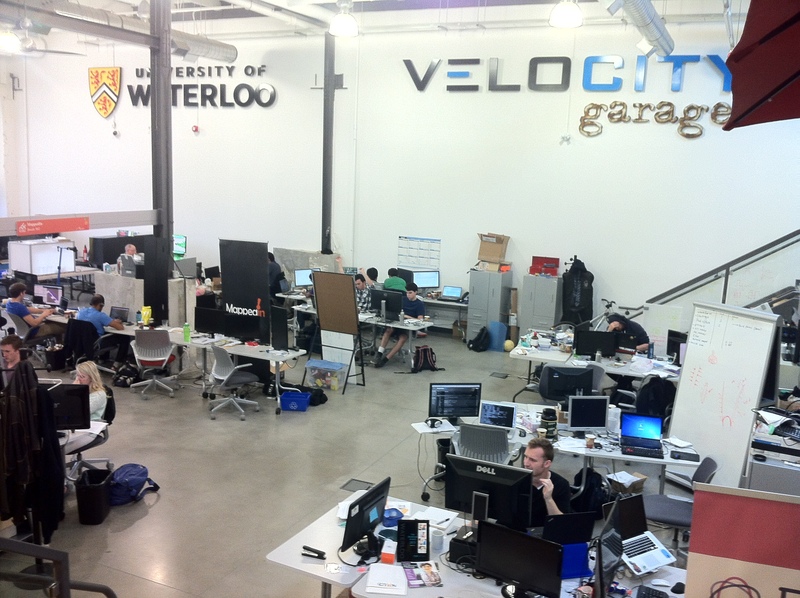 As an experiment in late 2010, Velocity rented space from the Accelerator Centre program at the Communitech Hub in Kitchener to house some teams that needed a longer incubation period. 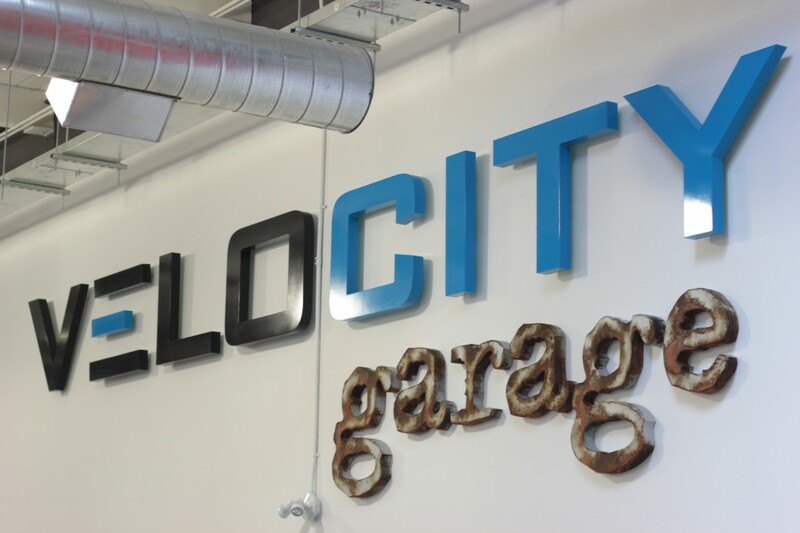 That became the basis for the Velocity Garage, 6,500 square feet of colour and energy that were a key part of Communitech’s own 14,000-square-foot expansion in the Tannery Building in February, 2012. Eight teams moved in on opening day, a number that had tripled within a year and that now exceeds 30. “We’ve stopped counting,” said Kirkup. There is no doubt the garage program was and continues to be a huge success. But that only exposed additional problems, Kirkup said. Using a sales funnel analogy, he said building companies through the garage was the bottom of the funnel, meaning the ultimate objective of everything that was being done. The residence program was the middle of the funnel. “But there was this massive gap at the top of the funnel” represented by students on the university campus who were interested in learning more about how to start a company but who were not yet quite ready to make the leap. 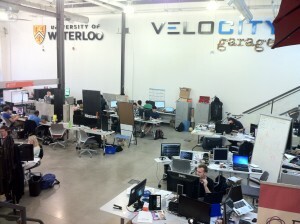 The response was to create Velocity Campus in the fall of 2012, a series of hands-on workshops at which anyone in the University of Waterloo community could come and learn about entrepreneurship. More than 700 people have participated over the past year. A further problem, common to all startup ecosystems, that Velocity swiftly ran into was a requirement to financially support the young ventures it was helping to create. The response was Velocity Fund that hands out more than $300,000 per year, much of it coming from the province of Ontario but with significant contributions from private individuals and Velocity program graduates. The money is paid in the form of grants rather than as an equity investment, something Kirkup said was a deliberate decision partly to avoid messing up the capitalization tables of young companies but mainly so that the most promising companies, which wouldn’t need or want an equity infusion, wouldn’t opt out of Velocity entirely. Making the honest and obvious observation that not all Velocity companies are of equal strength, Kirkup said the program needs the stronger teams to help teach teams that aren’t the best. New problems continue to be identified, and Velocity continues to evolve to address them. “There’s a huge number of hardware companies coming out of the engineering program,” Kirkup said. The residence program originally focused mainly on software, especially mobile applications, although even the very first cohort featured a hardware company, the Pebble smartwatch, that went on to tremendous success. So the next expansion of Velocity will be Velocity Foundry to cater to the specific requirements of hardware startups. On the day we met, Kirkup could not tell me where this new program would be housed but he did say they were down to the short strokes on getting space. Similarly, students in the other science disciplines at the university are keen to tap into the same support structures, although their needs are different again. “All a software company needs is a laptop,” Kirkup said. “For (a) science (company), you need lab space.” And so Velocity Science will be the next phase. The key to Velocity’s success, Kirkup told me, is that it exists in a university environment, one with a very strong tradition of supporting intellectual property and venture creation, but it exists outside the academic structure that more traditionally takes on such a role. “The key is, if we look at how entrepreneurship and the university are built out, we think…curriculum and extra-curricular (which is what Velocity is) should be separate.” Velocity doesn’t report into any faculty at the University of Waterloo; rather, it reports into the student success office. As for the future, well Velocity seems to take the stance of any good startup. “We keep finding really good problems that are worthy of solving and that we we think we’d be good at solving,” Kirkup said. Velocity iterates as swiftly as possible, although it can’t make major changes faster than the four-month length of a university term.